Trying to figure out how to blur in Lightroom can be tricky for any photographer. While Lightroom is an ideal choice for wedding photographers when it comes to cataloging and organizing photos, some of its other features (like blurring in Lightroom) take a bit more time to learn. Here at ShootDotEdit, we provide professional photo editing services for wedding photographers and understand how valuable it is to understand how certain tools in Lightroom work to add your unique photography style to your images. 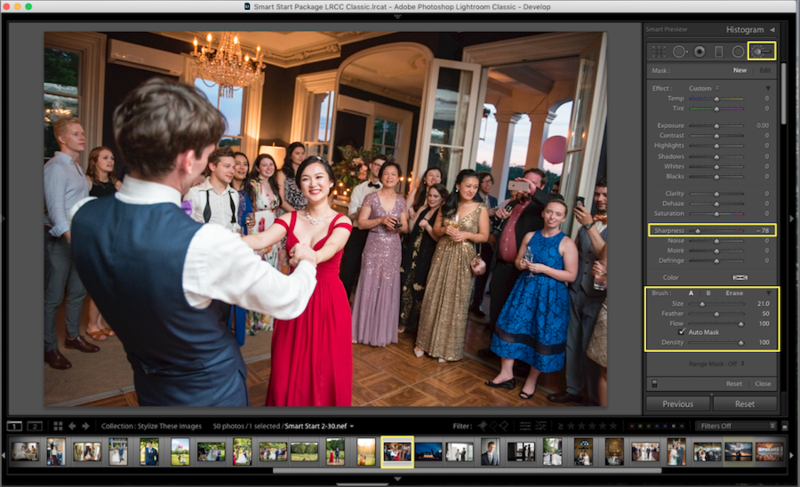 Knowing how to blur in Lightroom can help you create unforgettable images for your wedding clients, so we compiled a step-by-step guide to get you started. 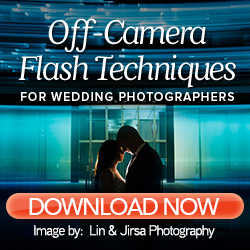 Keep reading to learn more about blurring your wedding photos. 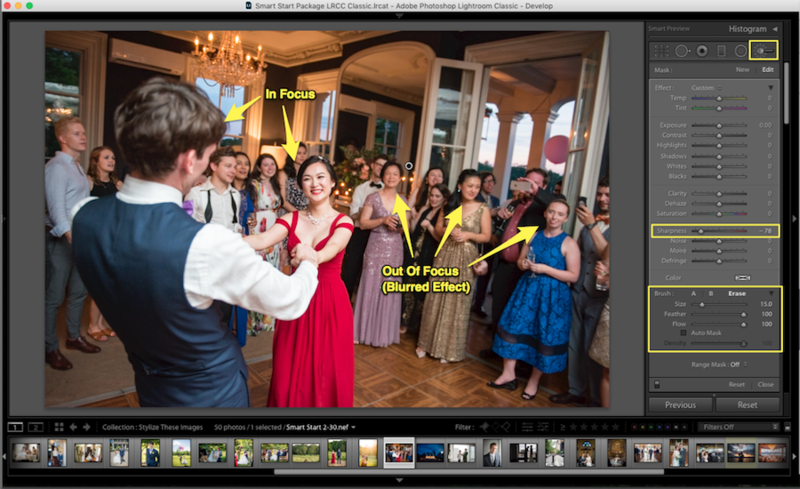 There are several reasons you may want to know how to blur in Lightroom, just like there are many reasons to utilize these wedding photography editing techniques. The blur feature can enhance certain qualities or subjects or even remove unwanted aspects of a photo. The 3 most common reasons to use the blur feature include: creating a focal point, enhancing the ambiance, and removing an unwanted element. Engagement sessions and weddings can often feel a little chaotic. Yet, you never want that chaos to be visible in your photos. The blur tool allows you to soften some of the action in the background while creating a central focal point. The bride and groom are the stars of the shoot, so blurring the rest of the image can place the focus on them in many of your images. This tool is also perfect for wedding food photography. You can capture a photo of the wedding cake while blurring unnecessary details in the background. This can work for details you want to highlight or venue attributes that stand out. When blurring in Lightroom, you can choose the degree of sharpness you want. Most photographers choose to heavily blur a photo’s background to make the focal points stand out more drastically. Wedding photos often have a dreamy quality about them. One way to achieve this effect is to blur the photo. For this type of enhancement, you would not want to blur the photo with the same degree of sharpness that you would use to enhance a focal point. If this happened, you would end up blurring the entire photo so much that it would be completely out of focus. Instead, you can work with varying degrees of sharpness to soften the edges of figures and lines and create a dreamlike haze. This effect, of course, depends on whether you want that look for your photos. Let’s face it: not every photo is perfect. In fact, many photos are far from perfect at the moment they are shot, even though they possess some amazing elements. Otherwise picture-perfect photos (such as the bride’s and groom’s first kiss as husband and wife) are often dulled down due to unavoidable circumstances (like the best man making a face in the background). 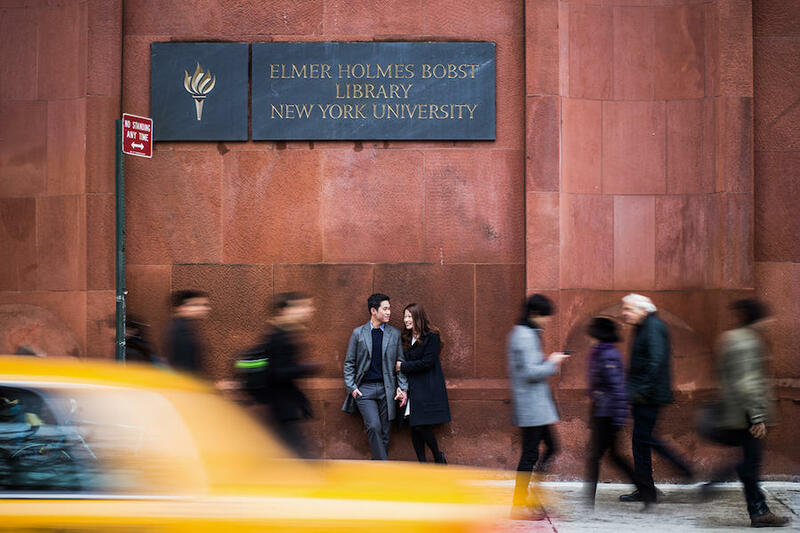 The blur effect allows you to remove any unwanted elements from your photos. From blemishes, to wine stains, to funny faces, you can remove anything that might ruin an otherwise perfect moment. Blur each photo individually for the best results. Make sure to switch to the “Develop” module before skipping ahead to the following steps. Experiment with different degrees of sharpness for different effects. Click the adjustment brush to reset your settings and toggle between basic and custom settings. Avoid using the same settings on every photo. Toggle between your edited photo and the original photo by checking the mask overlay box. Step 1: Import the photos you want to edit into Lightroom. Step 2: Enter Lightroom’s “Develop” mode. Step 3: Head to the brush panel to choose your brush. You may want to use a preset brush or create your own brush for blurring. Or, choose the adjustment brush. Step 4: If you are using the adjustment brush, choose the sharpness setting after selecting your brush. Step 5: Set your brush’s sharpness; anywhere between -50 and -100 will give you a blurred effect. Step 6: Begin applying the brush to the objects you would like to blur in Lightroom. Step 7: Export your image to save the adjustments. For blurred backgrounds, try setting your sharpness to -100. This is a good jumping-off point, but you might need to play with your settings to find the one that is best for you and your unique photography style. 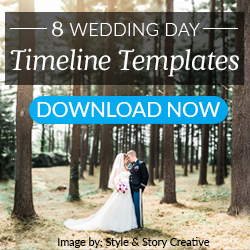 Since you cannot apply the same blur settings to every wedding photo and still create a professional product, you will need to edit each photo individually. 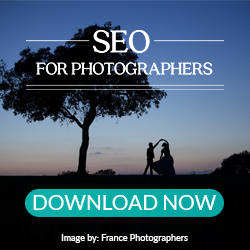 You will also need to edit each section of each photo individually to achieve the best results. Working on each photo can be time-consuming and may take away from other important aspects of your photography business. When you outsource photo editing to digital photo editing services, like ShootDotEdit, a majority of your editing workflow is taken care of. All you need to do once you receive your images back is add your final touches, such as blurring parts of your photo or whitening teeth. So even though it may take a bit of time to make those adjustments, you will have saved a tremendous amount of time on other parts of the editing workflow. To become fast and efficient in Lightroom, access our Online Training: Advanced Lightroom Skillsets with Jared Platt. 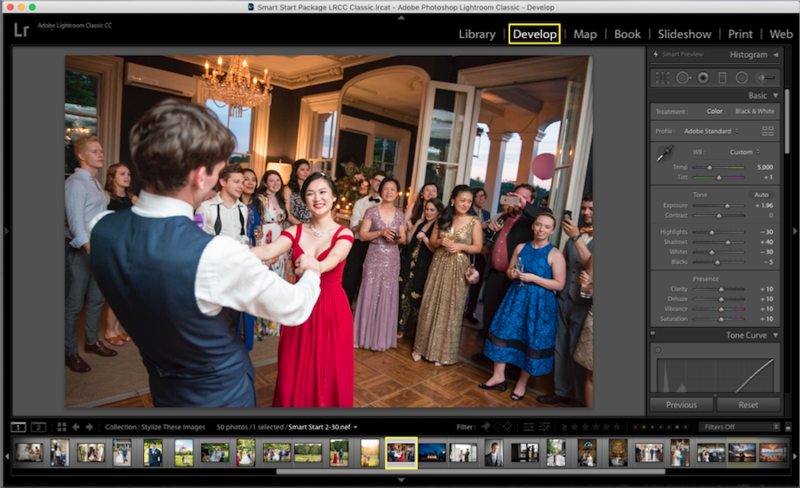 Throughout the Online Training: Jared focuses on how to maximize Lightroom and its features in your post-wedding workflow. Click on the banner below to learn more from the industry’s expert in workflow and Lightroom! ← Where Does Lightroom Store Photos?